Now you can have a festive spot to put your mouse all thanks to this Red Christmas Snowflakes Mousepad. This mousepad is red and on the red you can find many snowflakes with some being a lighter red in the background and on top you find white snowflakes in many styles. The whole mousepad is just great for to have on your desk at home or the office as it really brings the Christmas feeling as it is just so nice and festive looking. The mousepad has a nonslip back so that you can use it for all your mouse tasks like doing your work but also doing some gaming. 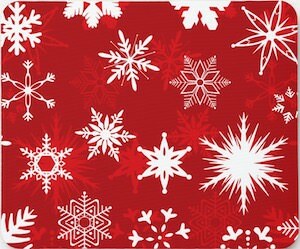 Get ready for the holidays by ordering your Red Christmas Snowflakes Mousepad. 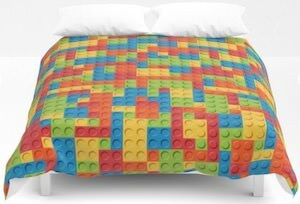 Now everyone that loves to place LEGO blocks can sleep in style all thanks to this LEGO Duvet Cover. 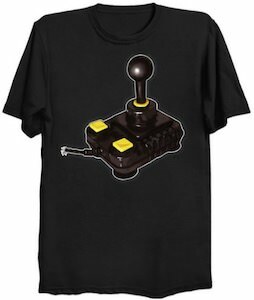 The duvet cover is white on the back but the front is covered in LEGO brings in many colors and sizes and has a hidden zipper to make your duvet fits securely inside it. And you can get this LEGO duvet cover in many sizes like Full, Twin, Twin XL, Queen, and King. Now you can dream about LEGO bricks while not having to worry that the bedding is made from actual LEGO as that would make it really heavy. Get ready for a nap under your LEGO Duvet Cover.